Easter Holidays children's activity day camps. 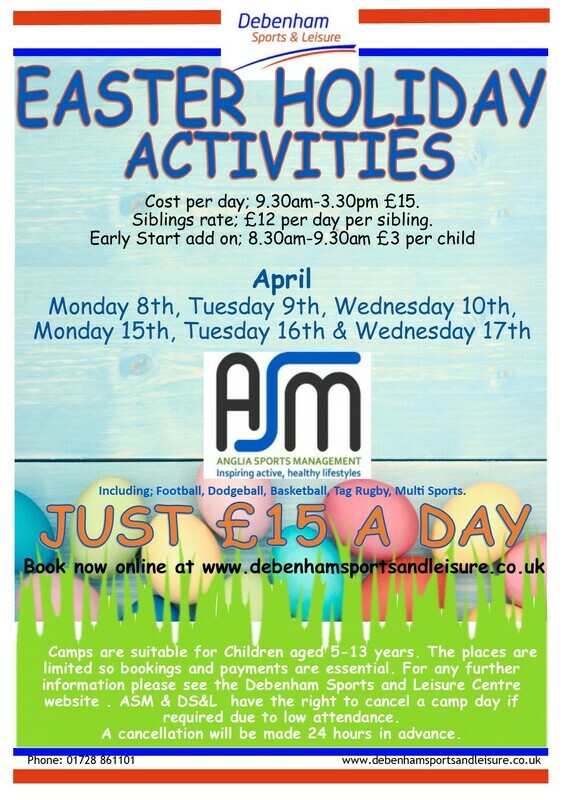 Holiday Activities for the Easter holidays, working in partnership with Anglia Sports Management. All the camps will be led by Anglia Sports Management coaches which currently run camps in the Manningtree area. The Camps are suitable for children aged 5-13 years and will be using the Sports Centre and Community Centre along with the outdoor areas throughout the day. We ask all children to bring a named water bottle along with them. We also ask that you tell us if your child has any medical conditions that you feel we should know about. All bookings need to be completed online, Payment can be made over the phone or you can visit our reception where our staff will be happy to take your payment. All of the coaches are Disclosure and Baring Service (DBS) checked, have attended relevant safeguarding and 1st aid training, it is not necessary for us to be Ofsted registered due to the nature of the activities and the fact we are not offering places to the early years age groups. Alongside the 9:30am - 3:30pm sessions we offer an early drop off, this allows parents to drop off from 8:30am and collect at 3:30pm as normal. The cost for this is £3.00 on top of your £15 a day. We also offer a discount for siblings at a cost of £12 for each additional sibling after the first full paying child.